Born and raised in Brooklyn, NY, Art has had a long and varied musical career over the last 50 years. He has been in multiple bands in Jersey and New York. He started out at 15 in a "garage" band called the Jagged Edge.and then various groups. He also worked as a studio musician. In 1970, Art played the Fillmore East with Wilbert Harrison (Going to Kansas City). Because of that gig Art signed a contract with Atlantic Records. He formed a band called Snailspace with his brother Wes. They recorded many demos at Atlantic but no releases. 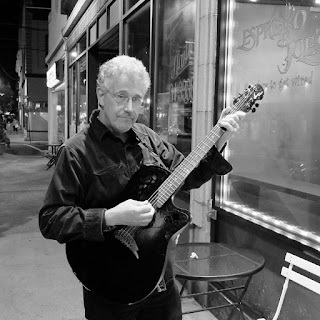 In 1983, Art was moved to New Jersey by Bell Labs where he worked for almost 20 years, all the while writing original songs and playing with local musicians at the Internet Cafe in Red Bank in the '90s. He played Riverfest in 2000 and 2001 in a duo called ReV, which produced a private label CD. His last duo was Lanes Merge with Bob Lang. They played at places like Val's and L'il Master's Grill, a short-lived open mic in Fair Haven that Art hosted. Art still writes songs and stays involved in the local music scene. Now sit back, relax and hear Art's story in his own words.